We hope you’re in an adventurous mood, Nomsters, because today’s post is all about the exotic. We had the pleasure of checking out Luk Fu’s lunar menu, and we were very impressed with Chef Joseph Ku’s creativity. In honor of the Chinese New Year, he whipped up 5 unique dishes to celebrate the year of the dog. They’re only available for a limited time though so if you want to try something very, VERY new, head on over to Live! Casino and Hotel before March 2nd. Wok sautéed sliced beef flank & tendon with a spicy, sweet chili sauce ($28): this dish had a serious kick – only order it if you can take heat because it was surprisingly spicy. The meat was very flavorful though – this was definitely our favorite plate out of the bunch! A huge thanks to Adam Yosim for being our hand model. Next came the squab ($48). It was fried whole to crispy perfection and tossed in a salt & pepper sauce. In case you were wondering, squab is pigeon. This was our first time trying it, and it tasted like dark meat chicken. If you’re big into gamey meats, give this dish a shot! You’re probably wondering what the plate below is! It’s braised pig’s feet served in a brown gravy with cilantro and fat choy. For those of you wondering, fat choy’s a popular Chinese vegetable. When dried, it looks like hair, but think of it as super thin & black vermicelli noodz. Long, unbroken noodles are served during the holiday to bring you longevity. Fat choy is a delicacy, and many Chinese households eat it to celebrate the new year. Here’s a shot of dish no. 4: sliced cuttlefish marinated in soy sauce and served atop hot & sour cucumbers with hoisin sauce ($28). This was very tender, and the cuttlefish had a similar consistency to that of a hardboiled egg. Enjoy it with the hoisin to up the flavor profile tenfold! Anddd that’s it for the lunar menu. What do you guys think of Chef Ku’s creations? Let us know by commenting below. 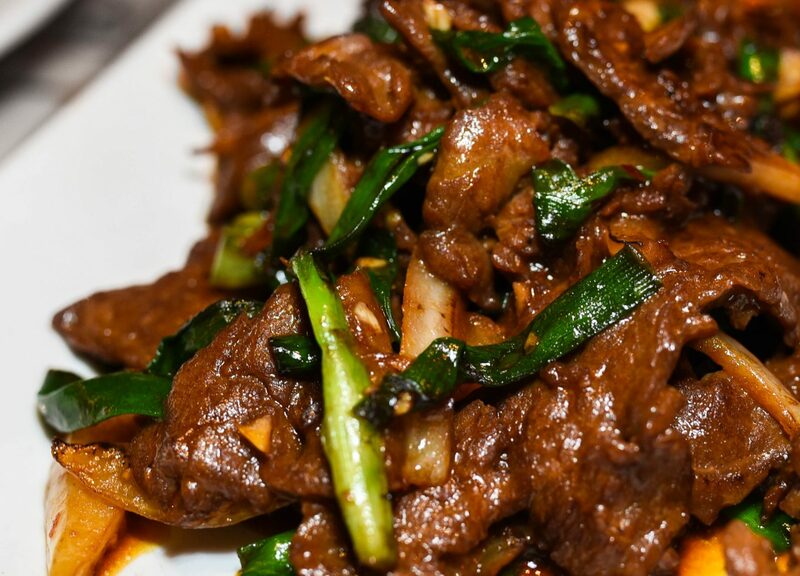 Also, we couldn’t leave Luk Fu without getting our favorite dish, Mongolian Beef (see photo below), so we got an order of that to-go. If you’re in Hanover and want some solid Asian food, make sure to try their noms! They have a huge menu with a bunch of different cuisines available so we can pretty much guarantee that there’s something for everyone. ‘Til next time, Nomsters. To browse other delish restaurants in Maryland, click here! Wow! Every dish looks delicious. I have to try this place out. Thanks for sharing!